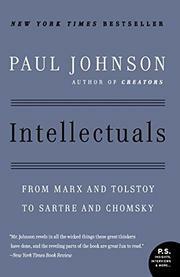 An iconoclastic collection of 12 critical and biographical estimates of leading writers--Rousseau, Shelley, Marx, Tolstoy, Hemingway, Sartre, Russell, and others--with a final chapter commenting more briefly on figures such as Orwell, Mailer, Baldwin, and Chomsky. Johnson, past editor of the New Statesman and the Spectator, has written numerous historical studies (e.g., A History of the Jews, 1987, and Modern Times, 1983), some of them with a distinctly conservative cast. His aim now is to examine his subjects' morals and private lives as indicators of the value of their advice on how society should conduct itself. As portrayed here, most modern intellectual idols are made of dusty clay: Marx was dirty; Shelley and Tolstoy mistreated their families; Hemingway drank; Sartre and Russell were vague thinkers, with little more to their program than a wish to side with youth and the left. On the whole, Johnson gives us a gallery of spoiled, irresponsible, untrustworthy egoists, whose thinking, in his view, was often as careless as their lives. Their deepest and most persistent failing was that they valued concepts more than people, doctrine more than human relations. Ultimately, Johnson finds them, as a class, indirectly responsible for the sacrifice of millions of innocent people in the interest of misguided schemes for the betterment of humanity. The question of why these intellectuals were so influential remains unanswered here, however. An outspoken study, then, founded upon the belief that traditional values and virtues are the most reliable guides to private conduct and public policy--and that the opinions of intellectuals are often dangerous.